The only thing I want to know from this last sequel is what Gwen and Gideon will do to Count Saint-German since they know that he is a crook. I am wondering also that what Count Saint-German do to run after his ambition to be eternal. Then, can the two young couple stop him? Will the ruby die after all? Those questions keep running in my head. They need answer obviously. But I find I am disappointed. Like watching Harry Potter last sequel movie (part two), this book seems anti-climax. Well, okay I am surprised when I know that Mr. Squirrel (Goodman) is the Count Saint-German's new appearance. But it still cannot amaze me as reader. I need more than that. I need more heroic story. Whereas, the story keep running around Gwen and Gwen. Fine, I know they are matched each other. But I think our main problem of this is about the time traveler and Count Saint-German. Yeah, though, the first and second story seems pretty to read. It's nice to have this trilogy as my read-book. Once I also crazy about it. I watch the movie (Germany production) and keep playing its soundtrack all day long in a week! So,,,?? 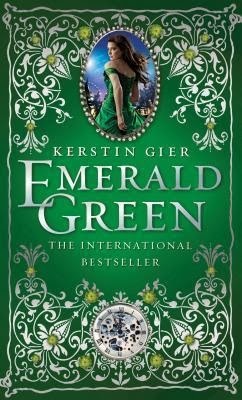 1 comment on "Kilas Buku: Emerald Green (Time Travel #3)"